This is just one of many photographs that I have taken of bison in Yellowstone. In the spring it's with the new born, in the winter they are foraging for food in the snow. This happened to be in February. 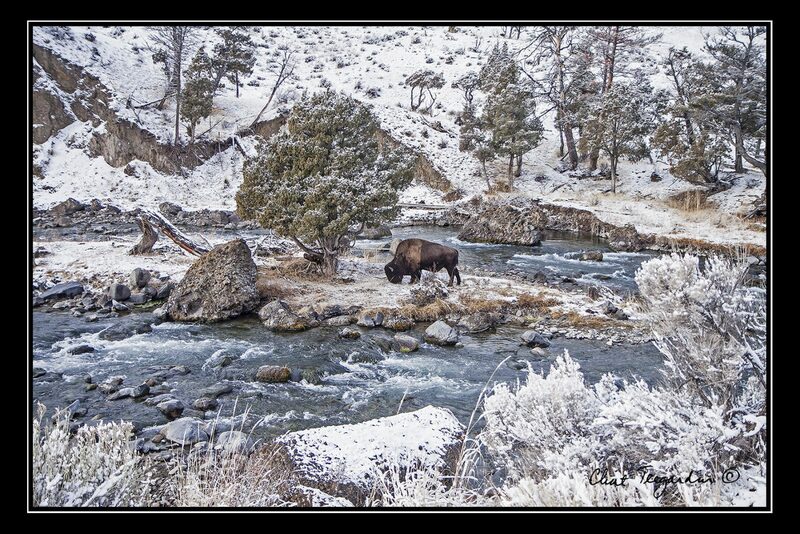 This bison had crossed the Yellowstone River to this island hoping to find something to eat. There had been snow in the prior 24 hours and it was spitting snow at the time that I took this photograph. When this image is enlarged to 12 x 16 or larger it look more like a painting than a photograph. Amazing photo, Clint. You’ve captured the perfection. Thanks, Jane. Marty caught this scene for me to capture with my camera amidst a foggy morning in Yellowstone. The photo looks like an oil painting when enlarged. A stunning photo of one of my favorite animals in a favorite location!! Awesome photo of our National Mammal. Way to go Clint !